Thousands of students walked out of school at 10 this morning in a 17-minute nationwide demonstration that served as both a tribute to the 17 victims of the Parkland, Florida, school shooting exactly one month ago and a protest against gun violence. More than 2,800 National School Walkout demonstrations were taking place across the country; click here to see our comprehensive recap of the sights and sounds from the protests in every time zone. Politicians’ thoughts and prayers in the wake of school shootings have been widely dismissed as empty gestures, but to St. Anthony Catholic School’s young students, prayer was a meaningful way to honor the Parkland victims during a day of national mourning and protest. “You’re praying for the victims, all the witnesses that saw the kids get shot, and you’re praying that their families are dealing with it in a peaceful way,” seventh-grader Patrick Cottman explained before the service. 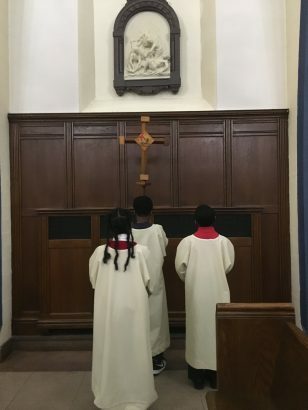 The prayer service allowed the school to address the issue in an age-appropriate way for the elementary and middle school students, Principal Michael Thomasian said, and tie the gathering to Lent, the somber weeks before Easter when Christians prepare to celebrate the resurrection of Jesus Christ. The students at St. Anthony, in northeast D.C., are young, but “they’re still in the world,” and they heard news about the shooting even if their parents didn’t discuss it with them directly, Thomasian said. Prayers are needed for more than just the 17 Parkland victims, the students said. Sixth-grader Summer Colbert-Nelson said it’s important to pray for all the schools. “It’s not just a Florida school that’s having bad stuff happen, it’s schools all over the world. 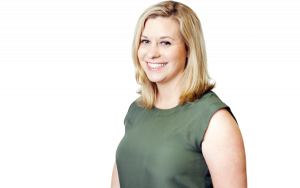 People are getting hurt and harmed because of one person who decided to make a bad choice and took his anger out on everyone else but himself,” she said. Cottman, Colbert-Nelson, and three other St. Anthony students spoke to The 74 ahead of the service. They hadn’t talked about the shooting much in class, they said, but knew the rough details, and they knew that a major policy response had been to give teachers guns — an idea they all opposed. Colbert-Nelson said she’s grateful nothing bad has happened at St. Anthony. Though the school educates children beginning in preschool, only the third- through eighth-graders participated in the half-hour service Wednesday. It began with a procession of 17 candles as the Parkland victims’ names were read before students prayed at the Stations of the Cross. One student carrying a cross, flanked by two others with candles, walked around the perimeter of the sanctuary, stopping at 14 relief images high on the wall. They depict Christ’s last day, from his condemnation by Pontius Pilate to his death on the cross and his body being laid in the tomb. The Stations of the Cross are typically observed during Lent, especially on Good Friday, the day they recount. 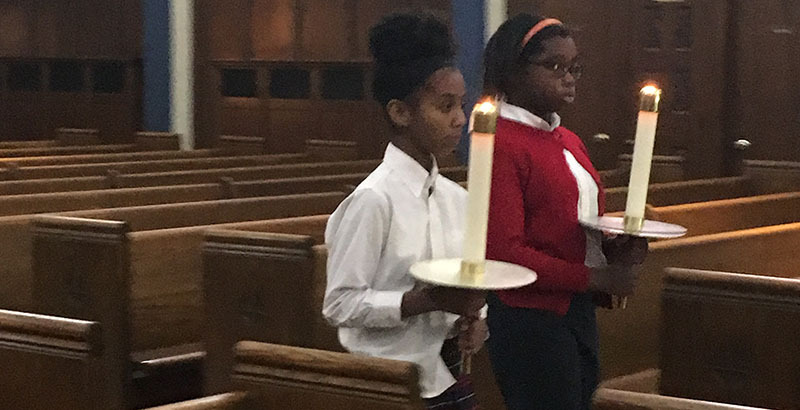 Each time the procession stopped, a student liturgist read a short passage tying that part of Jesus’s journey to an element of school safety, followed by a prayer. At the fourth station, for instance, Jesus meets his mother Mary, and a student liturgist talked about how schools “above all other places” should be safe, and parents shouldn’t have to fear sending their children to school. Students prayed for “an end to the senseless violence that has taken the lives of too many sons and daughters,” and for the parents who have lost a child. And at the seventh station, as Jesus falls a second time under the weight of the cross, students considered how many times the country has tried to make changes in the wake of gun violence, only to give up when lawmakers fail and public attention wanes. While the St. Anthony students held their prayer service, older D.C.-area students were protesting at the Capitol, demanding tougher gun laws. Some adults might not take the teenagers’ activism seriously, they said, but they shouldn’t give up, either. “If we keep marching every day, I think the adults will start to listen to us more and more,” said sixth-grader Landry Barbour.